How to read labels – the simple way! When I’m at the shops with my boys, I don’t have the luxury of time, the opportunity to stand still, or the quiet to calmly decode and decipher a food label. But understanding and reading food labels is important. So if you want to crack the code and scan them quick like Neo from The Matrix, here’s my no nonsense, get to the point, just need to know the important bits, ESSENTIAL guide to reading labels. This is easy. Ingredients are listed with the highest quantities first and in descending order. To be as close to nature as possible with a packet, avoid long lists of ingredients…ideally anything between 1 – 5 ingredients. And by ingredients these should be recognizable as real food, i.e. rice, quinoa, cinnamon etc. If you cant pronounce or recognize a word, chances are its not food but a chemical concoction made in a lab that should be avoided. Get savvy on serving sizes. Then double it. I have never eaten a serving size suggested on a packet…nor have my kids. Most interesting is counting how much sugar is in a serving. Sugar is listed in grams…not helpful, so lets convert that into teaspoons to get a real idea of how much there is. Here’s how: take the sugar amount on a packet, e.g. 16g per serving then divide it by 4 to get the teaspoon measurement. That’s 4 teaspoons. Now you’re likely to double that or more if your family is anything like mine. For many, well meaning health conscious parents we give our kids cereal and perhaps a juice at breakfast. Check out how much sugar that is and remember to double the serving size. Many children today are sent off to school already having consumed close to 20 teaspoons of sugar. Its no wonder they then can’t sit still for hours! Be aware of sugars in disguise. Just like we did with our sugar calculation you can do exactly the same when it comes to checking out how much fat really is in a packet. Now not all fat is the enemy. In fact contrary to popular belief fat can be very good for you. Get in the know and read about what fats to eat and what fats to avoid in my blog post here. Unfortunately when it comes to processed packet foods you can be certain those fats are bad and ugly. These vegetable oils, trans fats and hydrogenated oils such as canola, corn, soybean and sunflower oils are used so bacteria doesn’t touch it, allowing these packets to sit in our supermarket shelves for long periods of time. Makes you think if bacteria doesn’t want it, perhaps we shouldn’t either? But don’t go and do the understandable mistake of going fat-free or low-fat as these products have just replaced fat with sugars and toxic fillers. Get a grasp on artificial ingredients and chemical substances. BHA and BHT – A preservative found in most cereals. These are used to keep food from going rancid, but they have a number of health problems. Some studies claim they worsen ADD, ADHD and cause other behaviourial changes. They’re also known to cause respiratory issues such as asthma and skin conditions. Sodium Benzoates – Found in most fruit juices. They can greatly cause hyperactivity in kids, asthma, headaches, skin irritation, stomach upsets and can damage DNA in cells. Sulfites/sulphur dioxide – Commonly used in dried fruit such as raisons, sultanas, apricots, etc. Did you know dried apricots shouldn’t be orange? That’s the preservative at work. A dried apricot is brown and tastes delicious. The potential effects are many, from asthma and other respiratory issues, bronchitis, rash or hives, stomach upsets and more. Cochineal; carmines (120/E120) – Packets that say ‘no artificial colours’ double check! They’re right, cochineal is fairly natural but you might not like where it comes from as its animal derived. To be specific the extract is obtained from the dried bodies of the female Dactylopius insect. The potential effects: anaphylaxis, asthma contact dermatitis. May cause mild to severe allergic reactions in some people. Is prohibited in foods for infants! Found in many drinks, biscuits, baked products and desserts. Yum! MSG (monosodium glutamate) (621/E621) – Also goes by numerous other names such as yeast extract. This is a flavour enhancer that is best avoided. Symptoms are numerous and varied such as allergic and hyper-sensitive reactions, asthma, behavioural problems, depression, headaches and migraine and learning difficulties to name a few. Prohibited in foods for infants. You’re probably asking how can this $hit really be allowed in our food? Sadly it is and most of these chemicals have never even been tested so who knows what the long term effects are? Worst of all they’re everywhere. However help is here, you can start easily avoiding some of these nasty chemicals with one clever little app. Introducing The Chemical Maze. 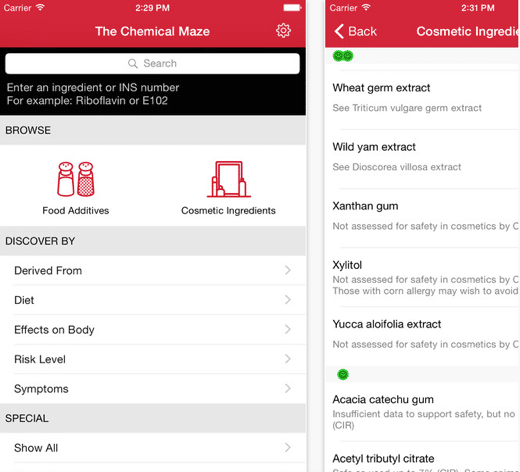 A gentleman by the name of Bill Statham, wrote The Chemical Maze and created an app so that you can instantly and anywhere identify dangerous food additives while you’re shopping or at home. Cool right? With this app, next time you come across an ingredient or number and want to check if its ok this app will tell you along with the symptoms and where it comes from. It’s easy and very convenient! Of course there’s more to labels than the above, but if you have a good grasp on these five points then you are truly on your way to making better food choices for you and your family. My other last tip: shop around the edges of the supermarket and not in between the aisles…that’s where all the ‘products’ are and not the ‘produce’ (the fresh stuff). Happy savvy shopping mamas! I hope this has helped. If there is anything you’d like to add Id love to hear from you in the comments below. 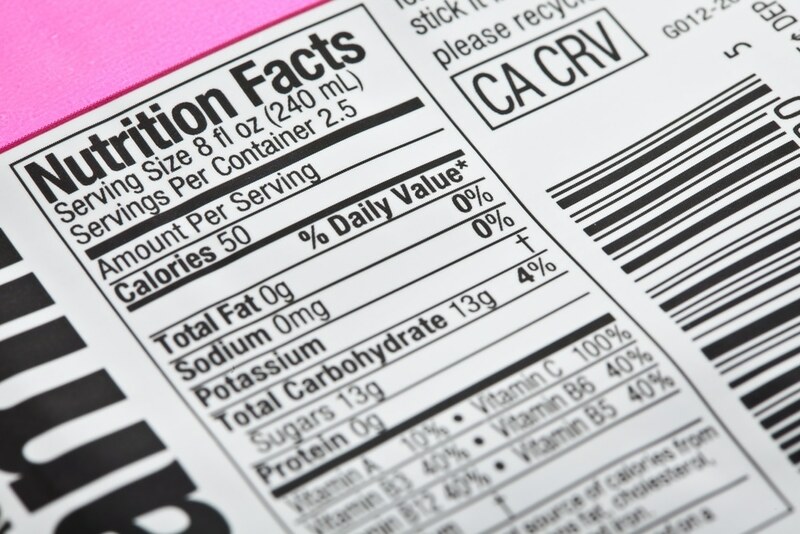 Share the post "How to read labels – the simple way!" Previous Post: « Why go dairy, gluten and sugar free (if you don’t have to)?